Our Technical Recruiting team has taken a page from the book of Agile and is holding daily stand-up meetings to engage and energize their team. 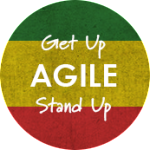 If you’re not familiar with the practice, stand-ups are used by Agile development teams to stay on track to project goals during 6 week sprints. Stand-ups are meant to be short, 15 minute sessions in which everyone talks about what they’ve accomplished, what they plan on tackling for the day, and any hurdles they are encountering. Participants physically meet standing up, because the goal isn’t to settle in for a long meeting – it’s meant to be quick. Stand ups are also daily in order to keep the project momentum going – tackling issues as soon as they occur instead of waiting for a monthly meeting to measure progress and hash out roadblocks. Stand-ups provide an opportunity to get everyone engaged and attentive first thing in the morning. By sharing daily progress with each other, it’s easier for each team member to measure themselves against their peers. A chance to discuss positive outcomes opens the door for sharing best practices among teammates. Stand-ups also enable team members to help each other tackle roadblocks before they get out of hand.